Thank you for choosing HideAway. 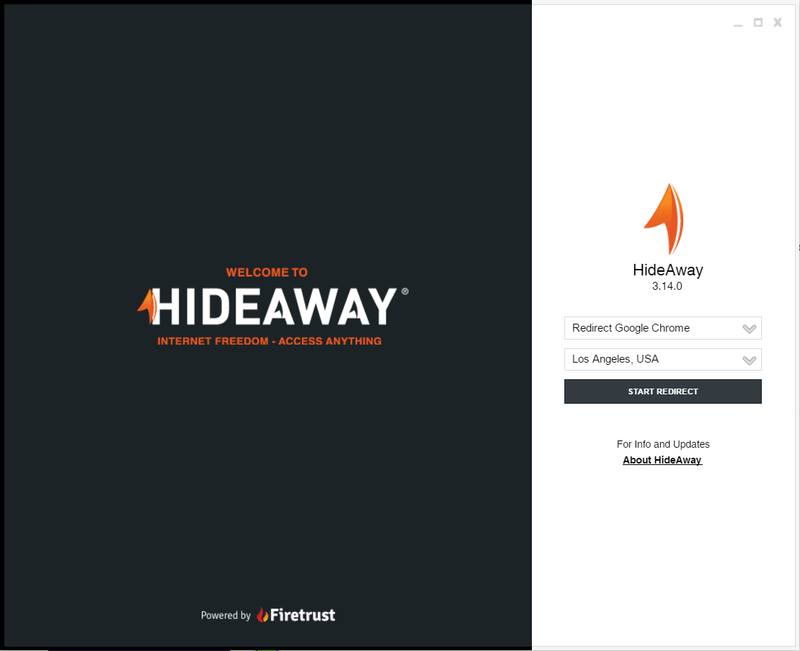 HideAway gives you so much more flexibility and speed than a VPN or Encrypted Tunnel. Not only can you shield your internet activity from prying eyes, keeping anonymous as your surf with super strong encryption, bypass internet geographical restrictions so you can watch any content, but HideAway does it better with more features as you can read on below. • Unblock movies, video, sports, tv, music in geographically restricted countries. • You're always connected, so no waiting to connect to watch or do something online. • Anonymous and secure internet surfing to protect your privacy. 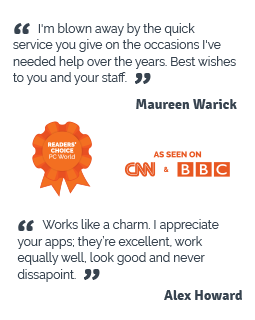 • Faster than a VPN, with high speed dedicated servers around the world and no data limits. While simple to use, you get the benefit of ultimate flexibility when you connect with HideAway. This is the screen you'll see after first starting HideAway. From here you can select All Computer, a web browser or other application to redirect. Then choose your country to redirect to, and click the Start Redirect button. Now you're redirected and can browse the internet in privacy and security. The License screen shows the details of your trial, and if your license is activated, it will show your license key and duration of license. Each license is unique to the device profile or computer you're using it with and can only be used once. You can click your email address at the top right of the screen and choose a different device profile. 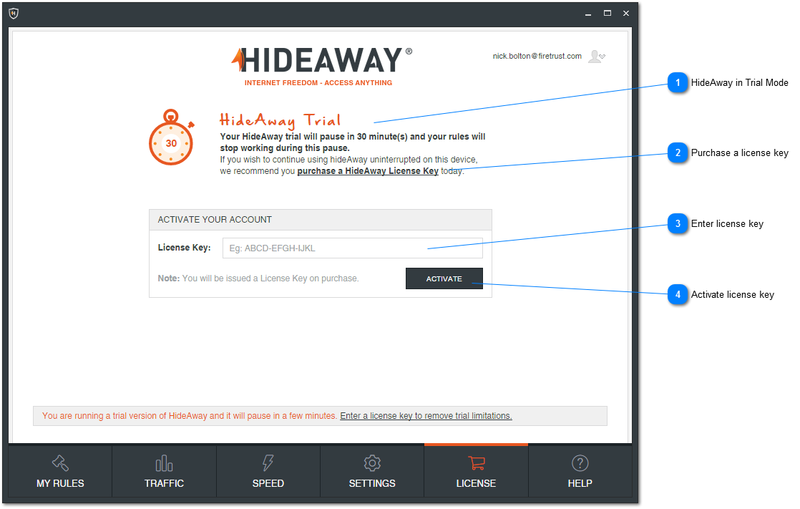 If you want to use HideAway on more than one of your computers at the same time, you'll need more than one license key. When you enter a license key, a master profile is created. If you use this master profile on a 2nd computer, HideAway will pause working on the initial computer, or you have the option of entering a license key for the 2nd computer and creating a new profile name. 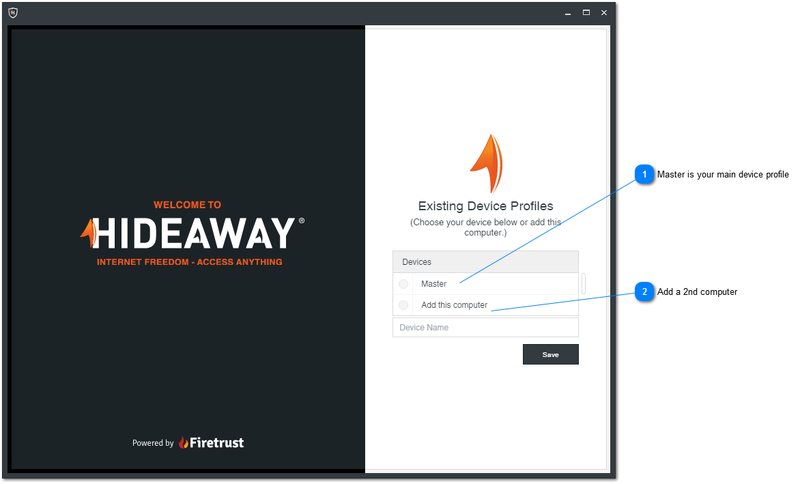 Each device profile is unique in that it has its own rules. 1. HideAway in Trial Mode - HideAway starts in Trial mode. This gives you 30 minutes of use, followed by 5 minutes when HideAway pauses. After the pause, you must Resume HideAway again to activate the rules. 3. Enter license key - Enter your license key. Each license key is unqiue to each device profile and once used on that device profile, cannot be used on another. 4. Activate license key - Press the Activate button to activate the license key.